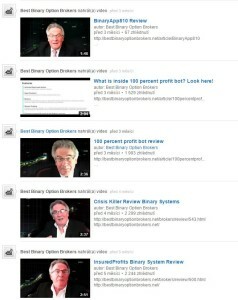 Scam: Professional Binary Robot by the Binary Professor George S.
Look at the scams that he is promoting. We have discovered a professional binary options scammer, so we have decided to warn against him in this review. He calls himself the Binary Professor and recently he has been promoting the Professional Binary Robot. The funny thing with him is that he provides proofs that he is a liar. He says that the main reason for creating the Professional Binary Robot is that over ´the years of testing binary options robots he has not found a single one that works. So he created his own robot that finally works. But look at his YouTube channel and you will find a lot of videos where he is promoting a lot of other robots saying that they are working extremely well. Moreover these robots are scams too, for example the Binaryapp-810 that we reviewed recently. So the conclusion is that George S. is a binary options scammer. He created his own robot for one purpose: he is affiliated to brokers and will get commissions with every new trader he refers. So he needs you to open an account and deposit money, that is why he is “generously” giving his robot for free. And that is also the reason why he is promoting a lot of other scams, he will promote anything that will get him affiliate commissions. As we always say, forget about robots that will make you money, they don’t exist. You have to trade binary options yourself if you want to get an income with them. Try it on a free demo to see if you can succeed. yes, I got “taken” by him now can’t even get my initial $300 back from optionfx!!!!! his robot does not work ,PERIOD! I hope people appreciate the service you are doing for us. I do. Thanks for this information. I tried some of this robots – and lost money only, of course. This “Professor” seems to be a true one, but he is a scammer as well, I’m sure. I take my hands away from people like him. – Thanks again! You can hire George if you want. He’s available on fiverr. You might need to prove the robot is not working by using it over some period I presume.